Arts eTeaching/eLearning warmly invite you to our 2017 eShowcase! 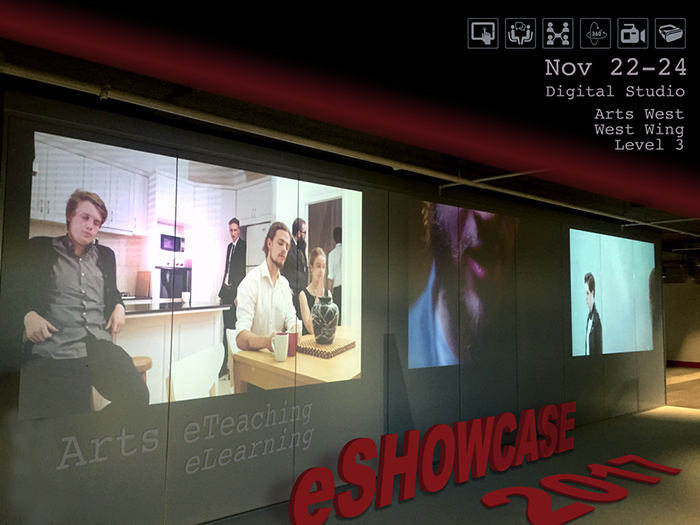 We invite you to drop by the Digital Studio, Level 3, Arts West, West Wing, anytime during 22 - 24 November, and view the eLearning/eTeaching showcase of videos! A collection of videos created for teaching will be screened (on play loop), including DIY videos, high quality videos, outcomes from Blended Learning Boot Camp, and video vignettes interviews and stories of innovative teaching and learning from 2017. Be inspired, see what others in the faculty have been doing this year, share ideas and explore some different approaches to using video in your teaching! In addition, during the 3 days that the eShowcase is screening, we are offering ‘mini consultations’ (30mins). If you’re interested in the options for incorporating video assets in your teaching, exploring how you might use video to engage with your students, incorporating eTools for collaborative & active learning, or possibilities for using virtual reality, but not sure where to start, then we'd love to begin the conversation with you and invite you to register for an individual mini consultation with one of the eTeaching team.